What do you do when the temperature reaches 95 degrees and the air is so dry that you can practically hear your skin crack? You go underground of course! Seven hundred and fifty-feet underground where the temperature remains a constant 56-degrees, and the humidity is a dew inducing 90%. This is not just any ordinary underground though. 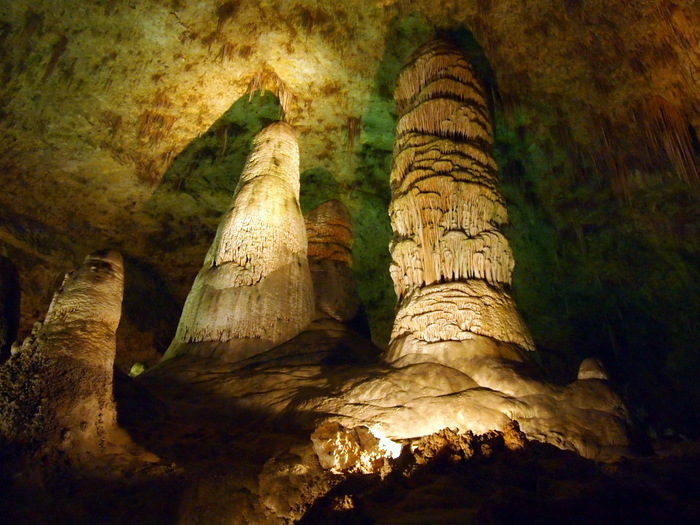 A trip to Carlsbad Caverns takes you through an underground world full of skinny dangling rock formations called soda straws, giant pillars resembling massive stacks of broccoli, and rocks covered in a bumpy “popcorn” coating. This is an underground world like no other. It is also one of the coolest national park experiences I’ve ever had. We set out bright and early for our day at the caverns, arriving around 9:30 to find a surprisingly full parking lot (who are all these people who get up so early on the weekend). Skipping the guided tour option, we flashed our America the Beautiful pass and received our ticket good for two entries into the depths of the underworld. If you don’t have a pass it’s $10 each and your ticket is good for 3 days. We chose to enter the cave through the natural entrance as opposed to riding down in the elevator because…I mean come on…an elevator vs. a trip through a giant gaping hole in the ground. The choice is obvious. The natural entrance begins with a series of somewhat steep switchbacks that snake down into the mouth of the cave. At first, the sphere of light from the entrance followed us and lit the way. 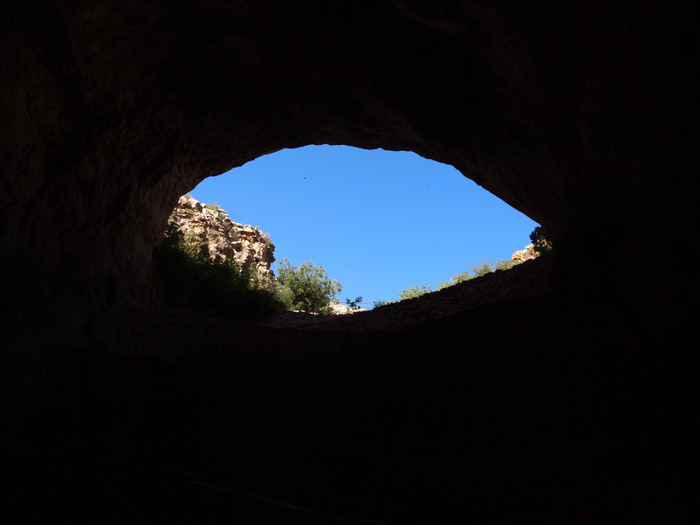 As we descended farther into the cave it grew smaller and smaller until eventually, all natural light disappeared. We continued to follow the path as it zig-zagged 750 feet down into the earth over a distance of 1.25 miles. Even though it’s called the natural entrance, it’s actually quite a tame journey with a paved surface and secure handrails the whole way down. Despite the number of cars in the parking lot, we didn’t see too many other people, and the path was easily wide enough for those that we did see to walk around us as we stopped periodically to marvel at the wonders all around. The lighting in the cave is expertly done. There’s enough light so you can follow the path without the aid of a flashlight, but not so much that you forget you are in a cave. Occasionally a particularly impressive formation is lit from below, above, or behind. Eventually, we reached the Big Room. This is the part of the cave that you can reach by traveling down in the elevator instead of walking through the natural entrance. I totally understand that for various reasons this is the better route for some people, but you really miss a lot by skipping out on the natural entrance. The Big Room should probably be called the gigantic room. Its total size is 357,480 sq. ft, or big enough to fit 6.3 football fields, for all you sports minded folks out there. Perhaps the most amazing thing about the Big Room is its height. When I think of a cave I think of a place that you need to stoop or crawl to get into. That is not the case at Carlsbad. The Big Room has a soaring tall ceiling that reaches 275 feet at its highest point! We followed the one-mile path around the big room stopping to read the informative signs and take as many photos as possible. Which wasn’t easy. Here’s the part where I give praise to my oh so patient husband for taking the time to get these shots. The truth is that I am a lazy photographer. Even though we have a DSLR camera, I almost always just keep it on auto and honestly have very little interest in learning how to use the different settings. For the most part, it works out okay, but in a situation like this with no natural light that wasn’t going to cut it. So Tim stepped up to the plate and took the time to set up the mini tripod and adjust the settings to get what I think are some pretty cool shots of this underground wonderland. It probably took us over an hour to walk around the big room. It was hard to go very far before wanting to stop and marvel at yet another crazy looking rock formation. By the way, there is some interesting science behind the formations of the caverns and all that they contain. It has to to with limestone, a shallow inland sea, faulting in the earth’s crust, sulfuric acid and all sorts of other science-y things. 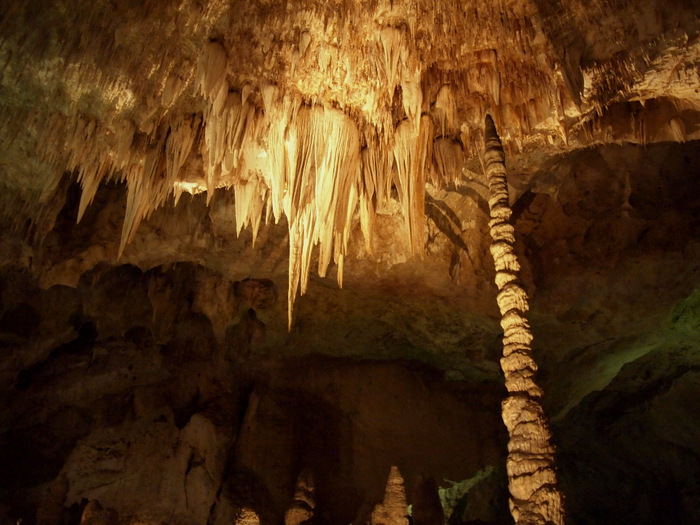 I’m not even going to attempt to explain it all, but it is interesting, and if you want to know more I would highly recommend checking out the Carlsbad Caverns website. Or if you’re like me and learn best from pictures, then be sure to look at this nice graphic that explains how caves are formed. We ended our tour with a very fast elevator ride up and out of the cave, a quick trip through the crowded gift shop for a sticker and magnet, and then back out into the dry heat. What an amazing experience! One that I would highly recommend to everyone. 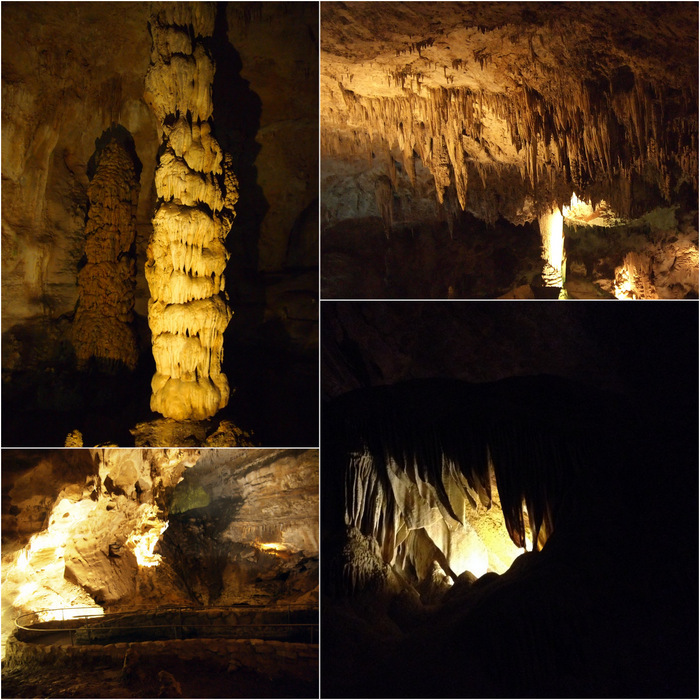 I want to mention real quick that we stayed at Brantley Lake State Park while we visited the Caverns. Located about 45 minutes to the north, it’s not the closest campground, but judging by what we saw on the drive it was the nicest. 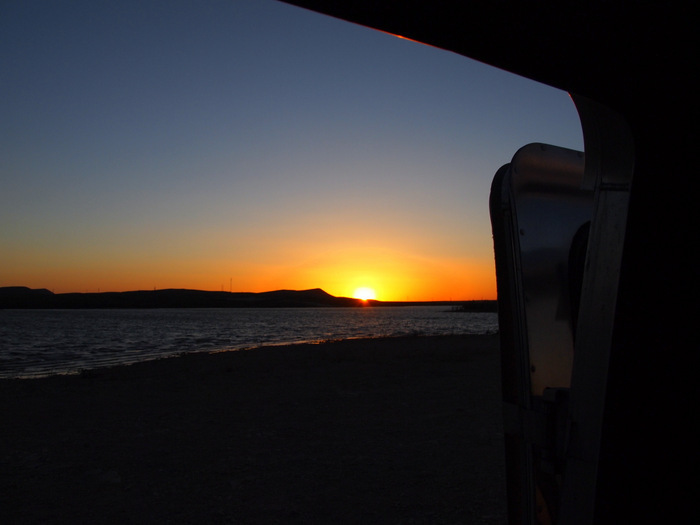 We arrived on Friday evening just before dark and headed down to the shore to find a spot in the primitive camping section ($8/night or free with the NM park pass). There was no one else around and we found ourselves a really nice spot right next to the water. We only planned to stay Friday and Saturday night, but when we arrived my initial thought was that we should stay longer. It just seemed perfect. Until it wasn’t. First, there was the crazy strong wind that whipped up on Saturday night causing our door to make a horrible howling noise. At some point in the middle of the night, Tim went out and moved the truck so it was parked parallel to us and blocking the wind, which reduced the howl from constant to occasional. Does anyone else have this problem? We think we might need a new door seal. And then there were the bugs. The awful, awful bugs. Hundreds of tiny, gnat-like bugs that came in through our screens and infested our house. Luckily they weren’t biting bugs, but on Sunday morning we had tiny dead bugs everywhere! It was so gross and after all that, I was more than ready to leave. Despite all of this, it was a nice campground that we would give another chance. We really didn’t have time to explore, but the lake was very pretty and the actual campground had some nice spots overlooking the water. Those bugs are usually only down by the water. That is why I stay up in the elec sites. Also just across the main highway is the free Seven Sisters area of the BLM without the bugs normally. At Dark Canyon Road near the highway to Carlsbad Caverns is another free BLM area. Additionally along hwy 137 is lots of free camping all the way to Dog Canyon campground in Texas. I had a feeling the bugs might just be by the water. 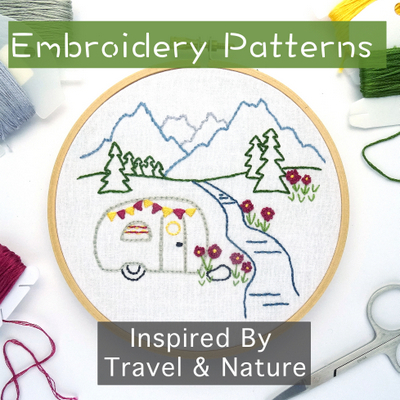 Thanks for all the great info about nearby camping! Right now we’re trying to get as much as we can out of our NM state parks pass, but I think next time we would check out some of the free camping in the area. I asked Tim whether y’all have been to Kartchner Caverns State Park in Arizona and he said you guys tried but the campground was full. 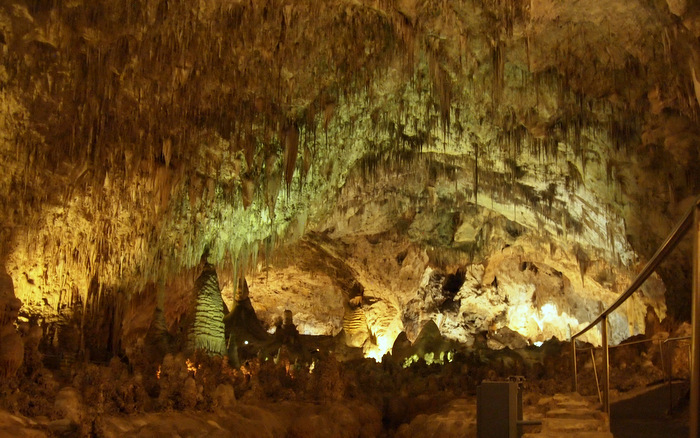 I haven’t been to Carlsbad Caverns, but I have been to Kartchner, and the experience is a bit different. At Kartchner you go through air locks to keep the underground world untouched by air from above, just like it has always been. I guess this makes for a more ‘natural’ cavern, or something like that. Definitely worth a visit if you guys ever make it back to the area. Kartcher sounds really cool. Probably why it was so busy when we tried to stay there. We’ll definitely try again the next time we’re in the area. We had the bug experience at Roper Lake State Park in Arizona. We still have to clean bug remains off the front curtains. Where are you off to next? You were right! It was incredible! One of the coolest places I’ve ever been in fact. Those bugs were awful! I am still finding dead bodies on some of the windowsills. After the caverns we headed up to Bottomless Lakes SP for the week, and then onto Santa Fe next. Wow, those pictures are definitely worth the effort! Such detail! I never saw the “broccoli” before now, but now that you mention it, I do. Still bummed that I missed the walk down because I got there after 2pm…had to take the dumb waiter! Broccoli was the first thing that came to mind when I saw those formations. Maybe I was just hungry after all the talk of popcorn and soda straws :) Bummer that you missed the hike in. You’ll have to go back because it really added to the whole experience. 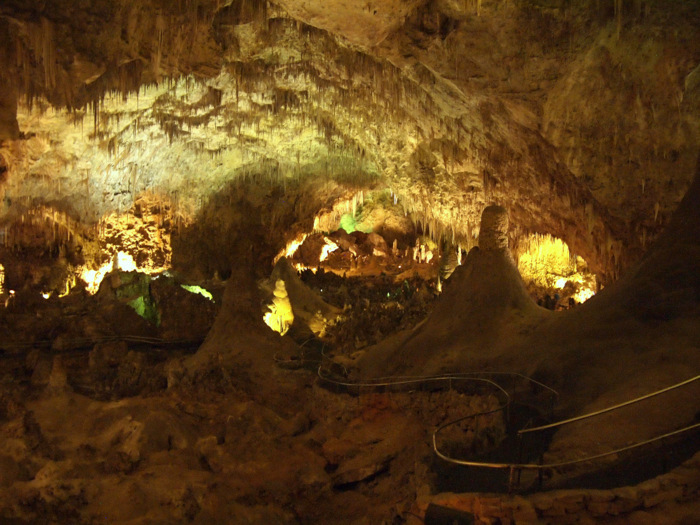 Carlsbad has been our favorite cave adventure so far too. Plus I love that you can take pics there and go on a self-guided tour (Kartchner, for example allows neither). Bummer about the bugs. We camped up by the main campground so I didn’t know about them. I really enjoyed the fact that you don’t need to take a tour. While I do enjoy the information that a tour provides, I would really prefer to explore at my own pace. The bugs were pretty gross, which is too bad because our spot next to the water was gorgeous. Next time we’ll have to try staying in the main campground. We get the same whistle or rubber vibrating in door seal. Had our dealer test drive several times but they said there wasn’t a noise. Sometimes with a strong sidewind it will howl or moan like a Halloween ghost just sitting beside the highway stopped. Of course we also get rain that comes in & runs down the inside of the window occasionally also. Love the drive from Williams to Kingman. With no traffic we drive about 45 mph if just to enjoy scenery and it is such a great drive & so peaceful. Of course if traffic is coming behind we speed up to limit but love slowing down whenever we can. We love to drive & as long as you are going to use the fuel anyway why not get the most out of your drive. Absolutely won’t do that if gonna hold up traffic. We feel to do that makes a black mark for all RV’rs. Yup, ours makes a howling noise when the wind hits us sideways. Hopefully a new seal will fix the problem. Either that or we just need to stay out of the wind! Our door will whistle if it isn’t shut all the way, so ya it sounds like your seal. Brantley Lake looks beautiful! I think it must be seal problem because we used to get it occasionally, but lately it’s been much, much louder. Will have to look for new one next week in Santa Fe. Despite the noise and bugs, Brantley Lake was pretty beautiful! 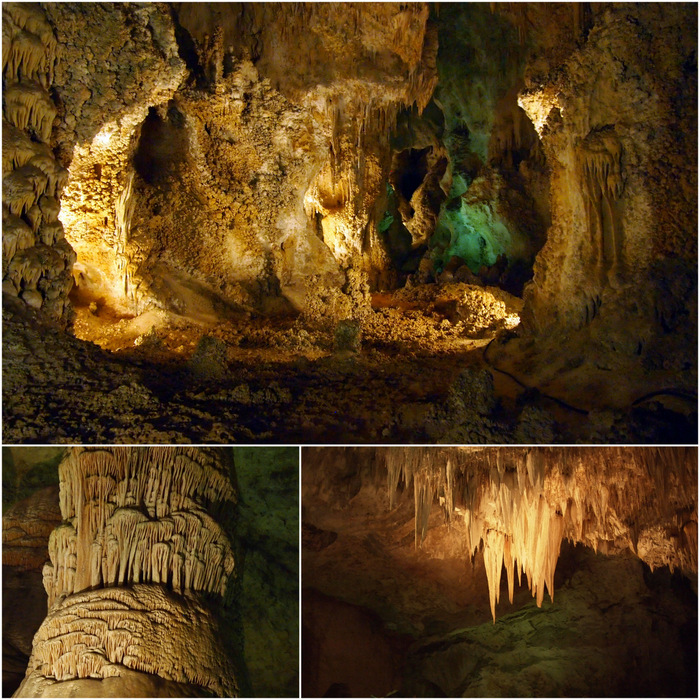 We loved Carlsbad Caverns also, nice job on the photos Tim!